We encourage all our pupils to progress to Trinity College Music Exams and they achieve extraordinary results. In 2006 one pupil from Music for Africa / Lehlake Music Project achieved a Trinity College ‘Highest Grade’ the Bronze Medal Award and in 2007 this was followed by two more pupils recieving the award. In 2010 Jeremiyah Monoge became the forth Music for Africa student to recieve the Bronze Medal Award. Trinity College issue only 50 Bronze Medal Awards WORLDWIDE for highest grades each year. From 2004 students have been entered for Trinity College Music Exams and have acheived astonishing results. In 2007 another 10 students were entered for Trinity College Music Exams grades 1-4 in June and a further 17 Pupils entered on November 10th 2007 from Grades 1- 6. Click here to listen to the May 2006 Exam Pieces. 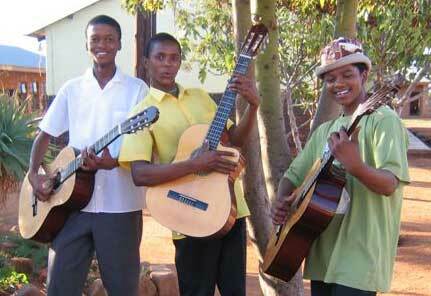 Two students at Durban University are doing well with the aid of guitars donated by Music for Africa. Lucky Swele is in the 2nd year of his Diploma in Jazz and Popular Music and Bethuel Tshoane is in the1st year of the Foundation Programme in Jazz Music. Lucky has also been supported with funding for the last 2 years. Lucky Swele Diploma in Jazz and Popular Music. 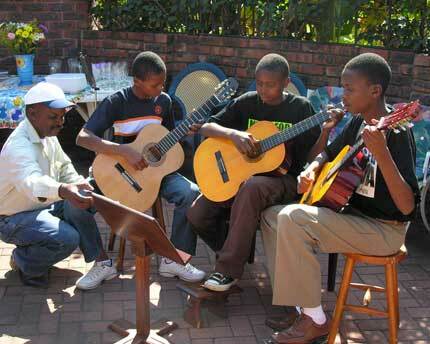 Bethuel Tshoane, Foundation Programme in Jazz Music.